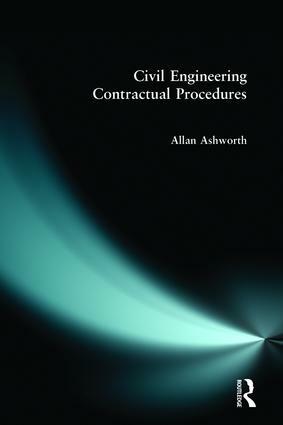 Civil Engineering Contractual Procedures gives an introduction to the contractual procedures, legislation and administrative practices that are used in the civil engineering industry. It introduces the principles of contract law, and the main forms of contract used in the construction industry. It then concentrates on the main forms of contract used in civil engineering, with the discussion based on the ICE Conditions of Contract. It looks at the obligations of the various parties to the contract under all the clauses of the contract. Civil Engineering Contractual Procedures provides a sound basis for anyone seeking an understanding of the contractual administration of civil engineering projects. It is an essential core text for all students of civil engineering and related courses at both undergraduate and higher technician levels. It will also be a useful reference source for those already working in the industry. Allan Ashworth was formerly Head of the Division of Surveying at Nene College of Higher Education, Northampton, and Lecturer and Course Director for Quantity Surveying at the University of Salford. He is now a consultant for the Quality Assessment Agency.